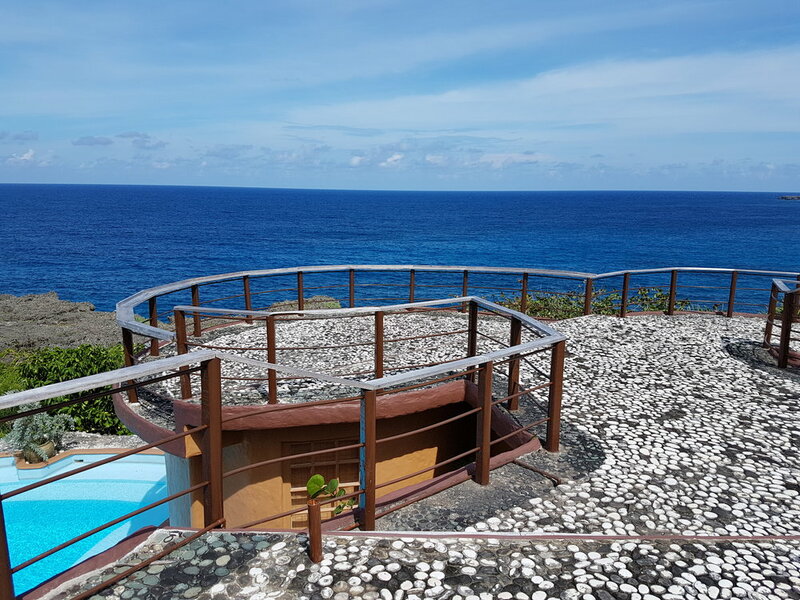 Great Huts' exquisite Cliffside Retreat by the Sea is ideal as an intimate haven for couples, families or a unique and unforgettable private event. 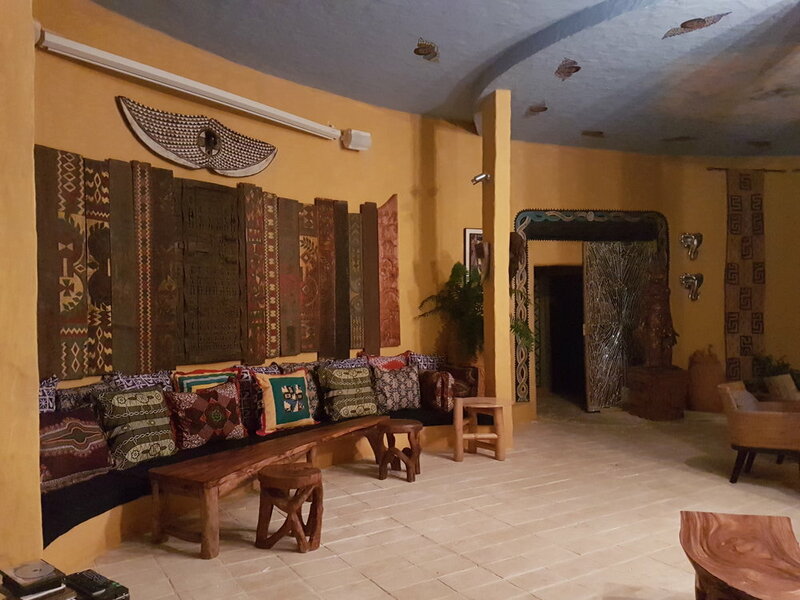 AFRICANA HOUSE FEATURES a lotus-shaped deepwater pool, a grand Great Room with cascading staircase and showcase of our African Art Museum collection, Jamaican paintings and sculptors, four regal bedrooms, air-conditioning with high ceilings, and Ethiopian inspired decor throughout. The 5,000-square-foot rooftop deck overlooks panoramic views of the dazzling Caribbean - sunrise is not to be missed. We would be happy to customize your next reunion, corporate getaway…or the wedding of your dreams! This large suite with its own separate entrance and kitchenette is your own private apartment on the edge of Great Huts property with everything you need close at hand and just steps away from the splendors of nature. 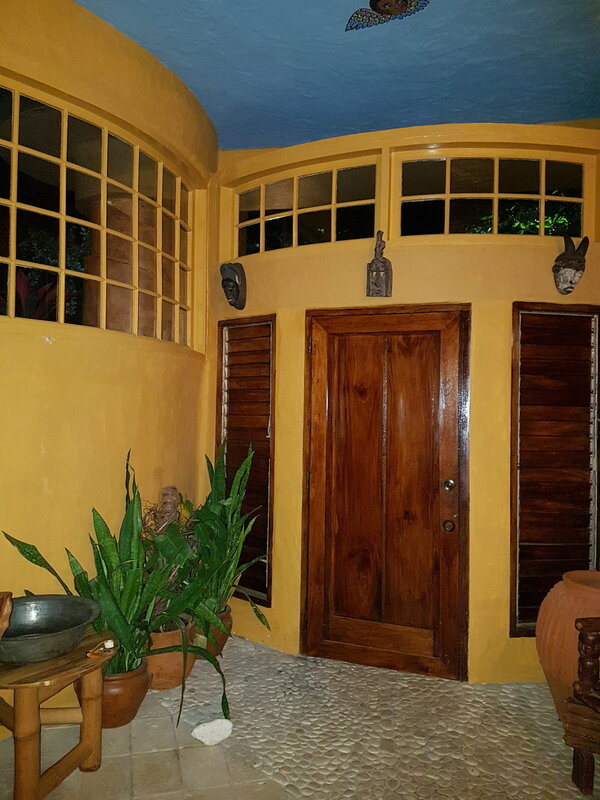 A luxurious, comfortable hideaway, perfect for anyone who appreciates 19th Century Jamaican antiques. There are also early 20th Century pieces from the Tropical Museum of the Netherlands. 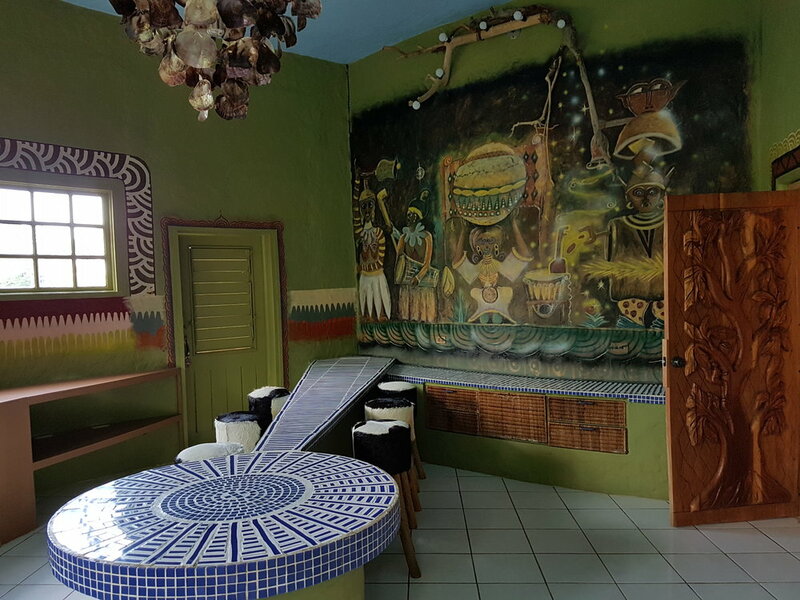 Features include a mahogany queen-sized four-poster bed, hand-carved desk and chairs, en suite bathroom with jacuzzi, dressing area and ample closet space. All in all, a showcase for Great Huts’ most exquisite furnishings and décor. The only Royalty suite on the top level of Africana House, features wraparound windows with captivating views of the sea and surroundings…a perfect backdrop for that long-awaited romantic getaway. Right next to the 5,000-square-foot Mandela Rooftop Deck, where the breeze wafting off the cool Caribbean Sea air can soothe your soul. The spacious and welcoming layout — with a 4-poster king-sized bed in rich mahogany, hand-carved tables, sumptuous décor and superb details throughout — has a large circular shower and tub, and ample closet and storage space. 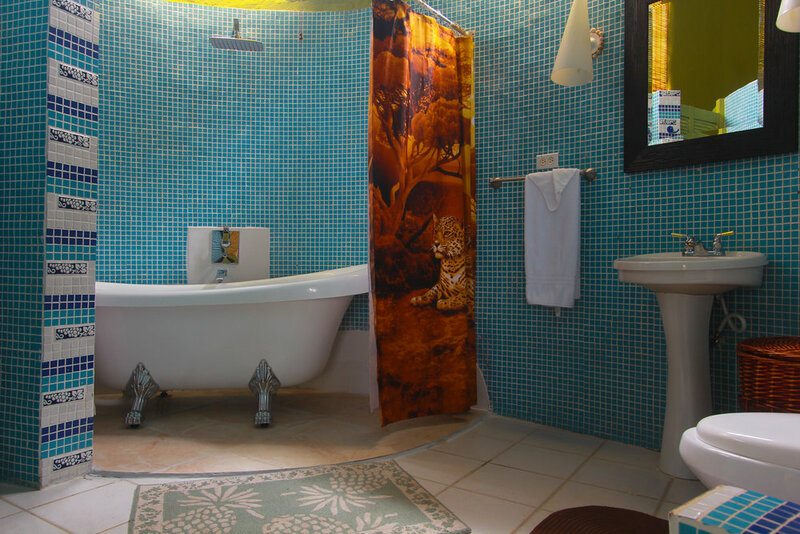 A generous two-tiered suite with stunning panoramas of the ever-present Caribbean. Arise in the morning and step through your own private doorway to the Lotus Pool, where you can take a dip or savor a sip of java while you take in the view. Handmade furnishings, queen-sized bed, an open-concept en suite bath with a clawfoot tub, 10ft ceilings and handsome stonework. Located just off the Great Room, where you can lounge, enjoy a chef-prepared meal, watch a film, sunbathe, listen to music or read. 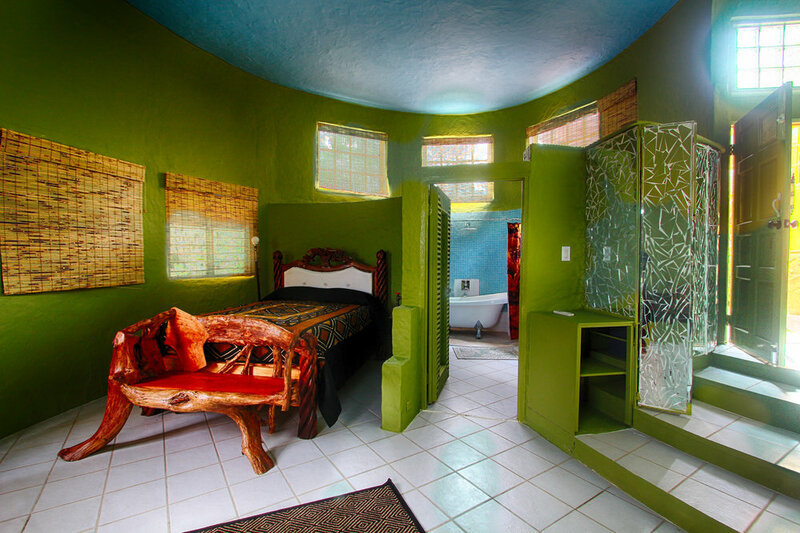 The smallest Royalty room, an intimate environment that is still lavishly furnished with handmade fittings, a queen-sized bed, sitting area, and an en suite bathroom with clawfoot tub, a 10-ft ceiling and ample closet space. Separate entrance for those who value privacy. Suitable for one or two people. Cafe Africa is our Designated Caterer. An amazing array of dishes from Ethiopia, Ghana, Kenya, Morocco ... just a taste of what is available. These classics dishes by Executive Chef, Steven Golding have been lovingly created to suit the Jamaican palate. Please take special care as there are ladders, loose gravel, and rocky stairs across the property. Guests are advised to bring sneakers and hiking shoes for rocky pathways and floors, water shoes, flashlights and insect repellent.